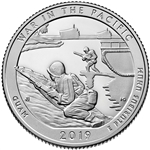 The War in the Pacific National Park Quarter is the third release of 2019 and the 48th overall in the America the Beautiful Quarters Program. The design portrays American forces coming ashore at Asan Bay, strengthening the number of troops on the island in the fight for Guam and its eventual liberation. Inscriptions are "WAR IN THE PACIFIC," "GUAM," "2019," and "E PLURIBUS UNUM." These 2019 America the Beautiful sets feature the Lowell, American Memorial, War in the Pacific, San Antonio Missions and Frank Church Park Quarters.